Give your back the break that it deserves with the Racing Office Chair. The Chair is made of Full PU leather for durability and comfort. 360 degree swivel allows you to turn easily for convenience. The height is adjustable with a 100MM Chrome gas lift for ease and comfort. The chair is padded in the Lumbar support and arm rest for comfortable sitting. 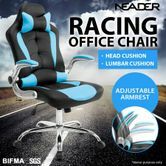 The Racing Office Chair will provide you comfort for the long hours in the office. I brought this chair for my partner and he loves it I was very happy with the quality and the price. Over all it was a good buy.